Binance has released a report showing that there is evidence to suggest that the massive market correction of 2018 means Bitcoin and altcoin prices have bottomed out. The research also highlighted the highly correlated nature of the virtual currency market due to the “herd mentality” that emerges during the late bull/early bear phases. 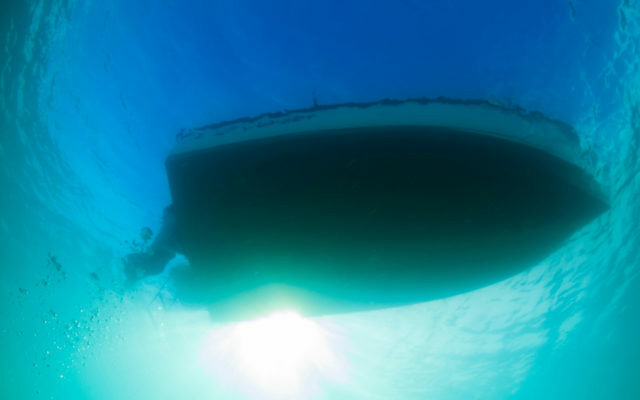 According to the details of the research published on Thursday (April 11, 2019), the steady recovery of cryptocurrency prices from their 2018 lows points to the belief that the market has bottomed out. 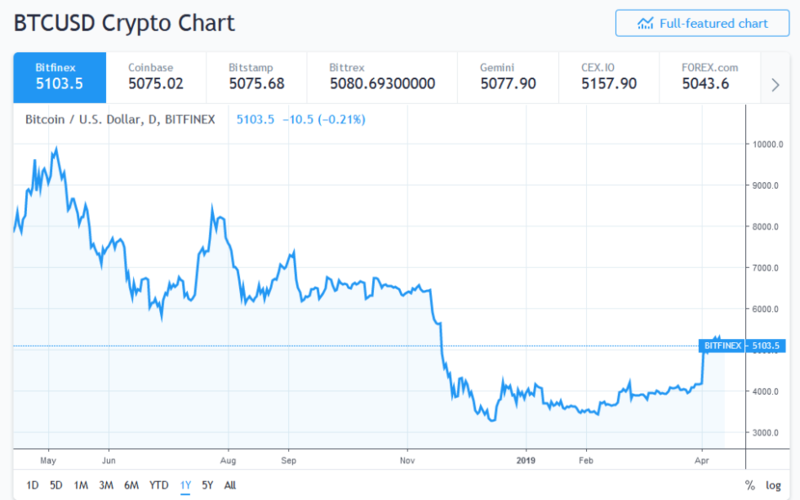 Since Bitcoin fell in early 2018 from $17,000 all the way down to $6,000 analysts have been calling a price bottom. Throughout 2018, these calls turned out to be inaccurate with the price taking a further dip in mid-November to reach $3,100. However, since the latest bullish breakout, talk of the Bitcoin bottom has become re-ignited. Analysts like Brian Kelly of BKCM LLC have expressed confidence of the mid-November crash being Bitcoin’s long-term bottom on the road to another bullish phase. One of the major talking points of the Binance research was the degree to which cryptocurrencies are correlated with each other. The report declared that the internal correlation of cryptocurrency prices increased during the bear market of 2018. Citing the co-movement phenomenon (also called “herding effect”), the report suggested that the irrational behavior of retail investors and the nascent nature of the market, in general, contributed greatly to the high internal correlation of cryptos. Another profound observation highlighted in the report was the relationship between altcoin correlation in USD and Bitcoin price action. 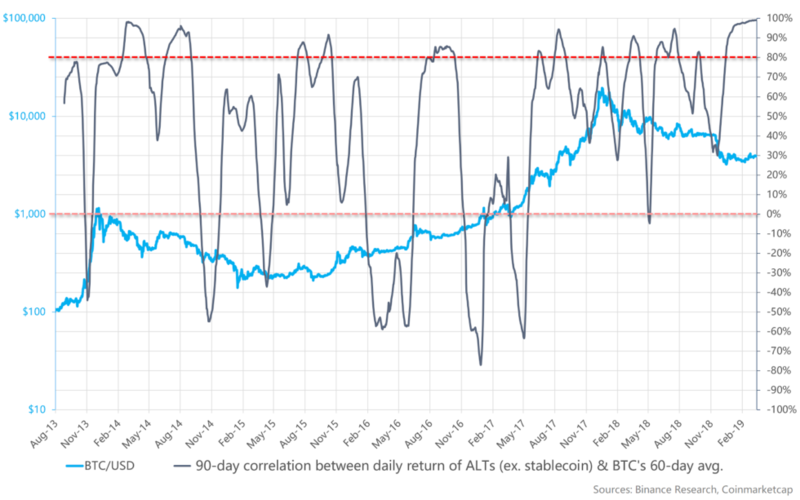 Using data from February 2014 to March 2019, the research team discovered that high periods of high altcoin correlation [between 0.8 and 1] corresponded to a trend reversal for Bitcoin. Given the short history of the crypto market, it may be premature to say that there is a causal relationship between peaks in correlation and market reversals, or if it’s actually a herding effect during the market reversals themselves. In trying to explain the co-movement phenomenon, the Binance research compared the investor matrix of the cryptocurrency market with that of mainstream stock exchanges in different countries. The research team discovered that both the crypto market and China’s stock exchange did have significantly higher turnovers – a phenomenon the researchers linked to the proportion of retail investors in both markets. Like the cryptocurrency market, retail investors dominate the Chinese stock market with their numbers standing at 99.8 percent in 2018. According to the report, retail traders also accounted for 80 percent of the trading volume in China’s stock market for 2018. Generally speaking, non-professional investors are prone to becoming overconfident or overly pessimistic in reacting to market trends, leading to higher potential transaction volume, more volatile prices, as reported in numerous studies. The Binance research also concluded that Bitcoin holders tended to “hodl” during bear markets only becoming active during significant bullish breakouts. 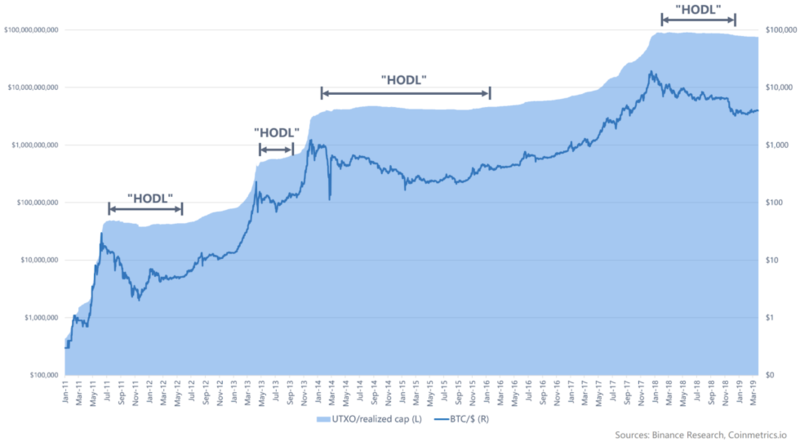 Using the “realized cap” metric, the researchers discovered only minimal changes in UTXO market capitalization during prolonged periods of downward price action. As previously reported by Bitcoinist, Tom Lee of Fundstrat says that Bitcoin bulls who have kept their powder dry since late 2017, are staging a return to the scene, buying up bitcoin. Do you agree that Bitcoin bottomed out in November 2018h? Share your thoughts with us in the comments below. Images via Tradingview, Shutterstock, Binance Research. The post Bitcoin and the Crypto Market Has Bottomed Out: Binance Research appeared first on Bitcoinist.com.